As seen in SJMA's exhibition Border Cantos, Guillermo Galindo makes musical instruments from objects found along the US/Mexico border--water jugs, border patrol flashlights, children's toys, discarded clothese--and composes music for those instruments. Here are highlights from a performance recorded at MACLA (Movimiento de Arte y Cultura Latino Americana) in San Jose, California, on March 6, 2016. MACLA is one of 39 community organizations that partnered with SJMA to present programming related to immigration, migration, and identity. Galindo will perform at SJMA on June 4, 2016, and July 21, 2016. In this unusual artistic collaboration, photographer Richard Misrach and experimental composer Guillermo Galindo joined the forces of their respective media to document the unseen, human reality of the US-Mexico borderlands. Misrach views the border—marked by a multibillion-dollar corrugated steel fence—as a place where politics, nature, and culture collide in often tragic ways. His photographs show us the small, poignant traces of human presence—clothing castoff by migrants, kids’ backpacks, the Border Patrol’s “drag” tires—that punctuate the vast and often threatening landscape. After learning that Galindo (a Mexico City-born US citizen) had stopped making regular trips to the border, Misrach began shipping him cast-off objects he collected on his photo shoots. Galindo transforms these scavenged items into instruments inspired by indigenous musical traditions from around the world. A discarded food can becomes the resonating chamber of an instrument modeled on a single-stringed Chinese erhu; empty shot gun shells are strung together to create a variation of a West African shaker. Border Cantos: Richard Misrach | Guillermo Galindo premieres immense landscape photographs by Misrach and ingenious musical sculptures by Galindo. Galindo also composes original scores for his assemblage instruments, and recordings of his orchestrations will be featured in an adjacent sound installation. This exhibition highlights the poetic resonance among these images, objects, and sounds. Together, the artists bear witness to the human consequences of a highly militarized, hotly contested border zone. For example, Effigie, a sound composition by Galindo (played on a plucked string instrument made of hollow pieces of wood, string, and discarded clothing) literally and metaphorically amplifies Misrach’s haunting photographs of the human effigies he discovered in the desert. Misrach and Galindo describe Border Cantos as an effort to correct the gaping omissions they see in mainstream discussions and media coverage of border issues. Their work bears witness to the complexity and magnitude of the concerns. Through the lens of art, they give presence to the thousands of undocumented immigrants who cross into the US each year and encourage a humanitarian perspective on the plight of all immigrants. 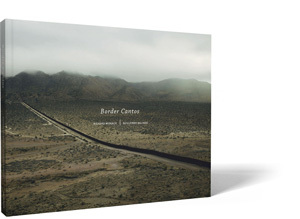 By bringing the border down to human scale, and by putting politics in the context of individual human lives, Border Cantos offers a provocative response to the polarizing discussions around immigration reform that have dominated local and national politics, both today and throughout the history of this country. visit the Border Cantos project website. Border Cantos premieres at SJMA and then travels to the Amon Carter Museum of American Art, Fort Worth, and Crystal Bridges Museum of American Art, Bentonville, Arkansas. Border Cantos is made possible in part by grant support from the Walter and Karla Goldschmidt Foundation, The John S. and James L. Knight Foundation, the National Endowment for the Arts, and the Creative Work Fund, a program of the Walter and Elise Haas Fund that is also generously supported by The William and Flora Hewlett Foundation. Additional support comes from the Consulado de México en San José, Claudia and Sven Weber, and Evelyn and Rick Neely. As seen in Richard Misrach’s photographs in the exhibition Border Cantos: Richard Misrach | Guillermo Galindo, walls and fences can have environmental as well as human impact. Hear about life in the communities that contain border walls from Dan Millis, Borderlands program coordinator of the Sierra Club. Hear first-hand from the artists about the intriguing and fruitful collaboration that led to the powerful exhibition Border Cantos. Photographer Richard Misrach and composer Guillermo Galindo will discuss their creative processes, the points at which their work intersected, and the surprises along the way. Re-examine the US-Mexico border via photography, sculpture, and sound in this tour led by Rory Padeken, assistant curator. Guillermo Galindo will perform on some of the musical instruments he created from objects found along the US-Mexico border. As seen in the exhibition Border Cantos: Richard Misrach | Guillermo Galindo, experimental composer Guillermo Galindo hand-crafts musical instruments from objects collected along the US-Mexico border. SJMA is collaborating with Oakland-based, alternative music organization Thingamajigs for this interactive workshop. Join David Samas, curator of the Window Gallery at the Center for New Music in San Francisco, and create your own instrument using found, everyday objects. The exhibition Border Cantos: Richard Misrach | Guillermo Galindo has sparked conversations about immigration and identity. Thirty-nine organizations from San Francisco to Watsonville, California, joined with SJMA to present programs that include theater, film, panel discussions, and exhibitions.